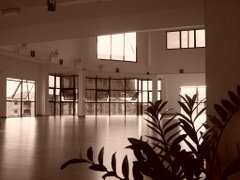 Living Arts Dance Studio: Why do I practice yoga? Our asana practice can have a positive impact on our lives because it constantly asks us to become more sensitive, more conscious, more aware of ourselves—not just of our bodies but also of our minds, feelings, and emotions. Asana practice can teach us to tune in to our beings and truly feel aware of the world around us. As our sensitivity increases, life becomes more rich and enjoyable because we can taste the unique flavor of each individual moment. More important, we also become more aware of what moves us toward our dharma, or life path, and what takes us away from it. This awareness makes us clearer and more peaceful, more able to elegantly handle life's endless dilemmas without feeling overwhelmed or fearful. As a result, we become more effective in all of our actions, and our presence begins to inspire and bring out the best in people around us. The awareness that we develop on the yoga mat, though seemingly small, affects all that is. As we become more aware in our yoga practice and in our lives, as we move away from force and violence and toward sensitivity, feeling, and awareness, we change our individual consciousness and actions. In turn, these changes influence the consciousness and actions of everyone we meet. Slowly, we shift the direction the world is taking. As we practice each asana, whether it be a challenging twist or a simple standing pose, we have the opportunity to become the embodiment of peace and to make our practice a prayer for harmony in the world. To all my friends who are on this divine journey, you & I are not alone. Namaste. Om Shanti.